Fine jewelry goldsmith Donna Chambers offers jewelry with a distinctive Asian influence by the use of antique gambling chips. The unusual artform of carved mother-of-pearl dates back more than 250 years in China, Ch'ing Dynasty c. 1736-1796. Thin translucent mother-of-pearl may bear the crest of a British royal family or story symbols, and were used as elegant gaming counters. Donna's settings evoke the same elegance in 14 karat yellow gold, and more recently available in sterling silver too, accented with pearls. Made in New York. Triangular shield shape of antique mother-of-pearl gambling chip has border design carved into it with floral motife in center. 14kt gold frame has flower and leaves at top set with small white pearls. Gold post is located at top edge of chip under flower. Overall 5/8 x 1.25 inches. 3/4 inch round ANTIQUE MOTHER-OF-PEARL GAMBLING CHIP piece is carved with floral pattern on the front, delicately framed in 14kt yellow gold with tiny pearl accents beside the ornate bail on top. Suspended from faceted 3-5mm PERIDOT, BLACK ONYX and CITRINE beads (the citrine are dark golden almost brown color), 14kt gold spacer bead accents with granulated edges. 20 inches long with toggle clasp, toggle bar is capped with white pearls. 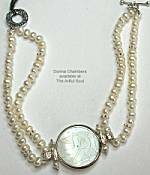 5/8 inch circle of ANTIQUE CARVED MOTHER-OF-PEARL GAMBLING CHIP is framed in sterling silver and attached to doubled strands of 5mm WHITE PEARLS. Toggle clasp closes at 7 inches long, designed to be worn snug. The delicate carving is a pair of birds, so lovely! The antique mother of pearl gambling chips are fine natural shell finely engraved. Please handle with care. Do not spray with cologne, swim in salt water, avoid chlorine, or showering while wearing. Clean occasionally with mild hand soap and tooth brush. Rinse thoroughly. Your jewelry will come with a Certificate of Authenticity and the story of the gambling counter chips.